The World Series qualifier is without doubt the highest stakes and cruellest of international sevens tournaments. To the winner goes a place at all of next season’s World Series tournaments, with all of the development potential and World Rugby support that goes with it, and to everyone else there is an air ticket home. And it is undoubtedly Scotland who will be feeling the disappointment most. Last out of the blocks when it came to the development of sevens in Europe, they were not even a European Grand Prix team until a couple of seasons ago. Despite playing in the first ever women’s sevens event twenty years ago, as a nation only Uganda had less experience of international sevens. Yet Scotland performed superbly and beat overwhelming favourites Japan in the semi-finals, only to lose to Brazil in the final a few hours later. That final was a game of cat and mouse for the first half. Scott Forrest's Scotland scored first before the Yarras held a slender 7-5 lead at the interval. Brazil went behind again early in the second half after Rhona Lloyd capitalised from the restart but a potent period followed. Bianca dos Santos Silva raced away from Lloyd before Thalia da Silva Costa extended their lead again with four minutes left on the clock. It was a lead that they would not relinquish. But – as is the way with sevens - day one proved no guide to day 2. the Yarras dominated a repeat match-up with Kazakhstan, a 21-5 victory booking a semi-final match-up against Kenya. In the final four, they continued to be precise with their work, working the ball well to their speedsters, and their clinical finishing helped them on their way to a 17-5 win. "It's a little indescribable [the feeling] but we worked really, really hard for this. 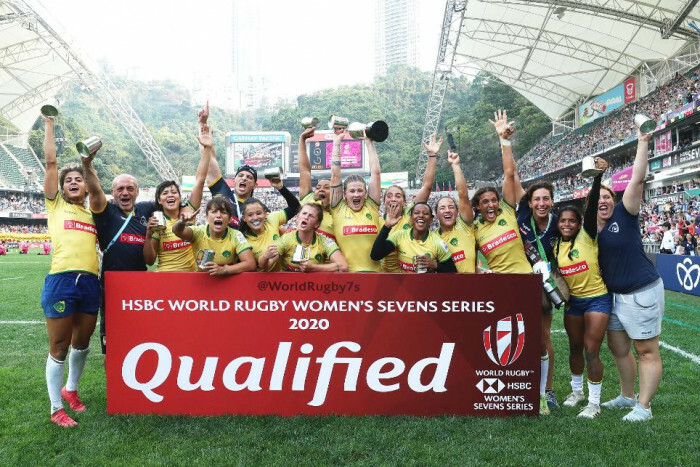 We just told ourselves to do everything we've been training to do and we finally did it," said vice-captain Isadora Cerullo after the full-time whistle. "It's an amazing feeling. I'm incredibly proud, not just of the 12 players at the tournament because we're a much bigger group than that. We're looking to build even more, bring in a lot of new players and show everyone that our programme is growing and that we deserve to be back on the world circuit."